Textiles Minister Smt. Smriti Zubin Irani inaugurates VASTRA 2017 in Jaipur, Rajasthan on 21st September 2017. 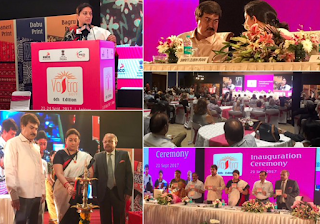 Speaking about the success of the mega textiles event Textiles India 2017, the Minister said that Textiles India was an effort not only of the Government; she said that it was an effort of the entire industry that wanted to tell the world in one voice, “Come, Make in India”. She added that nothing better says Make in India than Textiles in India. The Minister said this after inaugurating the 6th Edition of the 4-day international textiles and apparel fair VASTRA 2017, in Jaipur on 21st September 2017. The Minister said that this confidence in the textiles sector is bolstered by the recent high growth of FDI in the textiles sector. Recounting the success of the Integrated Skill Development Scheme, Smt. Irani also said that the success rate of placements of skilled workforce in textiles sector is now over 70%. She added that the Government continues to engage with the trainees even after placement to ensure that individuals are able to sustain work in their work chain for at least 6 months. The Textiles Minister expressed satisfaction regarding the inclusion of design and other workshops in VASTRA 2017. She added that the beauty and variety of the designs that we have had historically in our nation is something that the Indian textiles sector can and does leverage internationally. Smt. Irani said that in the growth of the textiles sector lies the growth of India and the growth of job opportunities. She said that the textiles sector provides direct employment to over 45 million people and indirectly impacts close to another 20 million households. She said that the Government of India has brought in Rs. 6,000 crore package specially aimed at providing support to the textiles, apparel and made-ups sectors.